Published July 2, 2018 By Leisa Good This post may contain affiliate links. Regardless, I only recommend sites I've researched and/or used and trust. Do you have an RV that doesn't get much use? Are you in an area where camping and outdoor adventures abound? Well, then keep reading, so you can learn how someone else can enjoy your RV– while you enjoy earning a little extra cash. However, like all ways to earn extra money, you have to weigh the pros and cons. What Things Should Be Considered When Renting Out Your RV? There can be significant costs to owning to maintaining an RV. This is why it is important to understand and feel comfortable renting out your investment. Here's a few things to consider before deciding to rent out your RV. Do you have sufficient insurance both for the RV and to cover any vehicle accidents? How often will you clean it after it is returned and before it goes out again? What will your policies be on pets and smoking? If the above doesn't sound like too much a hassle, and if you're okay with the extra expense, then it is time to consider a rental price. The average RV owner can earn $60 to $250 a night. How Do You Determine a Rental Price For Your RV? These seven basic considerations will be used to determine how much you can charge for renting out your RV. It is always a good idea to go ahead and do your own homework first. Type of RV – Do you have a Class A, Class B, Teardrop, etc.? Size does matter here. Location – Where you are located and what attractions you are close to can be a big seller. Number of people in the party – The number of people will also determine how much to charge as more people will create more wear and tear on your RV. Duration of stay – How long will these guests be staying and will you offer both nightly and weekly rates? Time of the year or season – During peak seasons, you will be able to charge more for renting your RV. Amenities – What are the accommodations within your RV? While some guests will want to “rough it,” others will want to have air conditioning, cable, and Wi-Fi. The more amenities you can offer, the more you can charge. Ratings – The higher your ratings are (5-star is the highest), the more in demand your RV will be. Probably the most important thing to do, is price comparison. Find out what others with similar RV's are charging. Also, don't hesitate to check out RV reviews on SiteJabber and TrustPilot. So, What Are These 5 Sites for Renting Out Your RV? Airbnb – By now most of you have heard about AirBnB (see Airbnb review), the site that allows owners to rent out their residential homes, apartments, vacation homes, entire Bed and Breakfasts, igloos and even caves! However, did you know that you can now rent out your RV using this service? Go to their website and do a search for RVs. When I did a search, I found a very nice RV with a 5-star rating in the Texas backcountry for $130 a night which included Wi-Fi, air conditioning, heating, cable, and even an outside hot tub and shower! Airbnb insures up to $1 Million in liability and property damages once you create an account with them. Campanda – Available in over 42 countries, this company likes to refer to itself as the “Airbnb of RVs”. The company will cover the vehicle's value as well as offer $1 million in liability and also offers 24/7 roadside assistance. Once you sign up on their website, and start receiving offers—you name your own price and select the customer. Campanda will do the rest by collecting the payment and the security deposit. Once the vehicle is returned in good order, Campanda will return the security deposit to the customer. You can expect to receive your rental earning via direct deposit within 2-3 days. There is no charge to list with Campanda other than their commission, which is passed on to the customer. Craigslist – Most of you are familiar with Craigslist. You can rent houses, cabins, and RVs. As long as you are comfortable doing all the screening, collection of fees, etc, it might be a good place to advertise. The best part about Craigslist, is that it is free. Posting on Craigslist basically acts as an old-fashioned classified ad but with Google Map capabilities, however, many people do buy, sell or rent RVs on the site. Outdoorsy – Similar to Campanda, Outdoorsy will also let you select your own renters and set your own prices. Outdoorsy's $1 million liability insurance will cover your RV no matter where it is driven. A DMV check is done on all drivers before allowing them to rent your RV. There is also 24/7 roadside assistance coverage with a pay-as-you go plan and a customer support team to assist both renters and owners. Outdoorsy claims that 93% of its RV owners have a 5-star listing. Outdoorsy charges a 10% fee on the total rental charge plus a security deposit; however, both are picked up by the renter. Once the RV is returned you will typically be paid within 24 hours after pick up. RVshare – Similar to Outdoorsy and Campanda, RVshare actually started out as an RV rental company then realized that there was an entire market of individual RV owners (peer-to-peer), who also wanted to rent out their RVs. RVshare offers 24/7 roadside assistance and also a 5% cash back to renters on their next trip. RVshare also has its own rental insurance coverage program with both collision and comprehensive coverage. Listing with RVshare is free, but they do take a 15% fee from each booking. There is also a one-on-one coaching program available to RV owners. 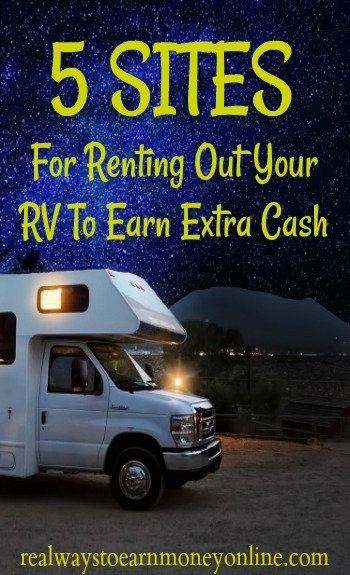 We hope you've found this list helpful if you're an RV owner looking to earn some extra cash! And if you'd rather earn money from inside your RV, rather than profiting from someone else using it, check out this list of ways to earn money while you travel.